Acrylic paint, dish soap and contact paper are all you need to make your own scratch-off cards. 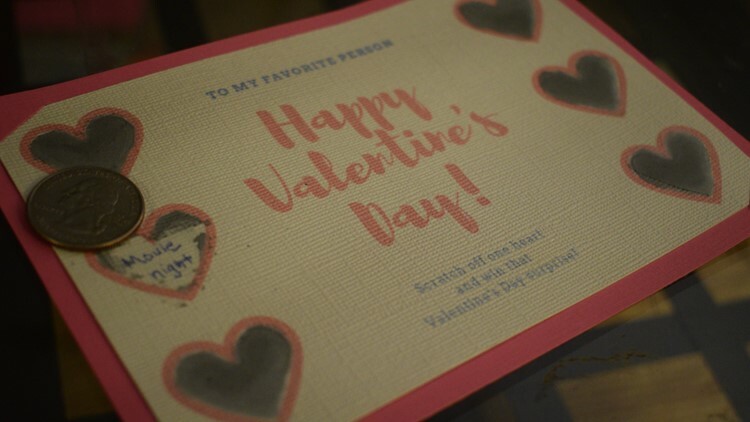 If you are looking for a heartfelt and creative Valentine's Day gift to make at the last minute, these scratch-off cards are the perfect solution. Start by designing your card. Some simple ideas are a "Scratch to win your Valentine's Day surprise" or "10 reasons why I love you." You can also find printable designs online if you aren't feeling super creative. I printed mine on cardstock, but regular printer paper works as well. Fill in each of the circles or hearts using a pen. You now need to cover each of them so the paint will come off when scratched. Contact paper - which can be found at craft stores, hardware stores, Walmart, Target and on Amazon - works the best for this. Trace each of your circles or hearts onto the back of the contact paper. Cut each out and stick over the shape. If you do not have contact paper or don't want to buy it, clear tape or even white crayon also work. In a bowl, mix about two parts acrylic paint with about one part dish soap. Use that mixture to paint over your covered shapes. You will probably need about two coats of paint before its completely opaque. The paint can now be scratched off with a coin, revealing your message beneath!